Hiya guys! I'm still recovering from the amazing weekend at Polish Con. I had so much fun (still can't wipe the smile from my face) and definitely plan on sharing my haul with you all this week. For today I'm sharing swatches for the Contrary Polish's May contribution to the Polish Pickup Collaboration. If you're not familiar with the concept, the Polish Pickup offers a fun, interactive experience that allows you to submit theme ideas, vote for your favorite theme, and selectively purchase your favorite polishes every month. This month the theme is.... Science! Now let me introduce you to Feel the Spark from Contrary Polish! Feel the Spark from Contrary Polish will be available for purchase through the Polish Pickup Shop May 5th through May 8th. Feel the Spark can be described as a deep magenta base with strong purple shimmer and holo micro flakes. 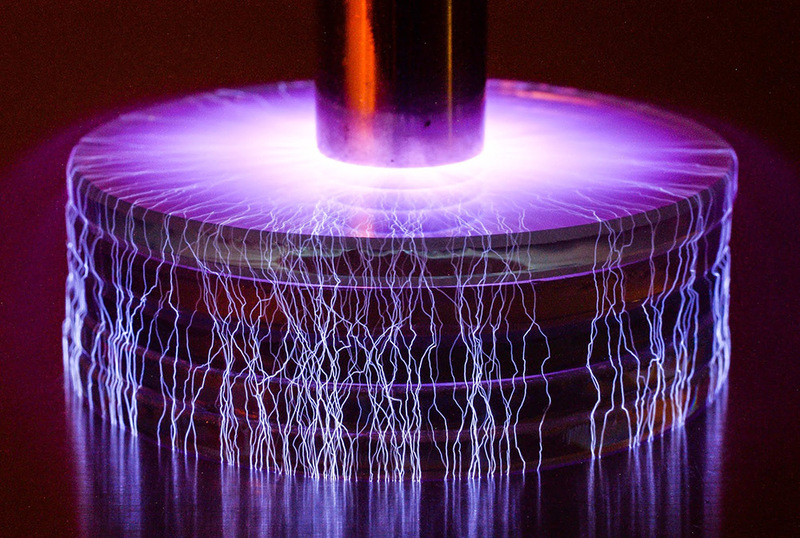 Inspiration for the Science theme this month comes from this gorgeous photo of a Tesla coil. Words cannot describe exactly how gorgeous this shade is in person! There is so much shimmer and color shifting with the slightest of hand movements. The formula has a sheer jelly-like application with great build-up and even coverage. It has a smooth finish and balanced consistency, not too thin or too thick. Dries down smooth and with a lovely natural shine. Shown in three coats and sealed with a glossy topcoat. While finishing up my swatch session I decided to rotate my hand around in the light-box and accidentally took this photo. I normally wouldn't include it, but it ended up capturing and mimicking the “lightning” in the inspiration photo perfectly! Overall.... do I really need to tell you?! I definitely think this gorgeous polish is a must-have! The formula is perfection and Carrie did an amazing job at making her inspiration a polish reality. It is to date my favorite shade from Contrary Polish. I seriously cannot praise this polish any more without sounding like a gushing fan-girl, haha. But tell me guys, are you in love with this polish as much as I am? To recap, Feel the Spark from Contrary Polish will be available for purchase through the Polish Pickup Shop May 5th through May 8th. OMG this polish is STUNNING!